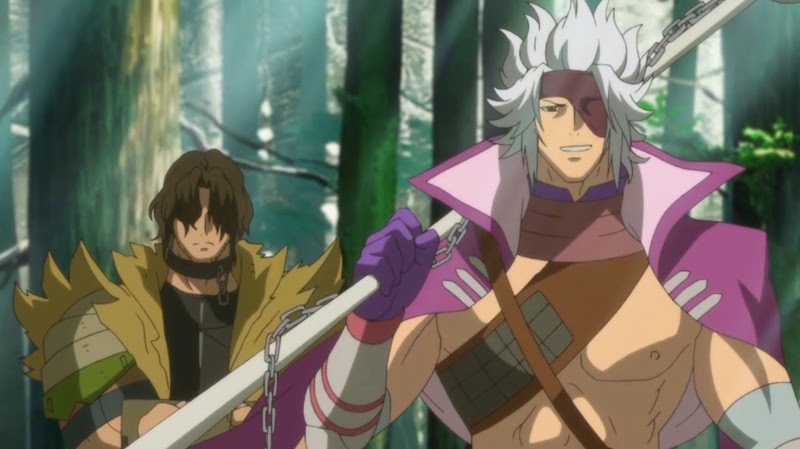 With today's episode of Sengoku Basara Judge End we've officially reached the series' halfway point. This week's initial television broadcast on NTV was at 01:55 on Sunday morning (Japan time). The YTV and BS Nittere broadcasts are shown over a week late. The episodes are streamed weekly on Saturdays at 14:20 Eastern Time with English subtitles. They've added the first five episodes already with episode six scheduled for today. Subscribers will be able to watch the latest episode on the same day it's available in Japan while free users have to wait a week. FUNimation also have the home video rights, so if the stream is popular the series should eventually be dubbed into English. Even though the videos are region-locked, fans outside the US can still visit the site and rate the videos to show that there's demand! ADN are offering the series online with French subtitles. So far, the first four episodes are available. They charge a monthly fee for the service. A French-subtitled broadcast will take place on J-ONE - Canalsat (50) and Numericable (38). The show's broadcast was announced as being 'day and date with Japan' but it's taken a while for them to catch up. So far, five episodes are online with English subtitles so hopefully the sixth will appear very soon. Viewster is a free ad-supported service. 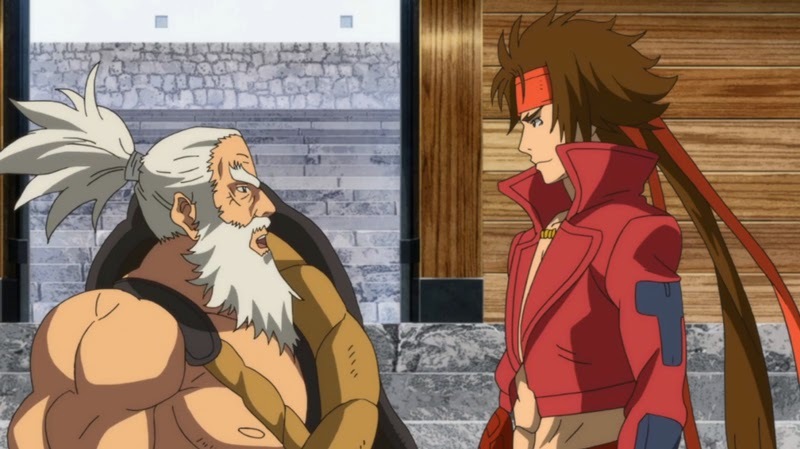 The rest of this post contains spoilers for the first six episodes of Sengoku Basara: Judge End and some low quality screenshots. Please note that I'm watching the show in Japanese and using my preferred spellings for character names; they won't necessary match the localised spellings if you're watching one of the subtitled versions! Prior to the events in Judge End, the warlord Oda Nobunaga was betrayed and killed at Honnouji by his retainer, Akechi Mitsuhide. Mitsuhide was subsequently defeated by Toyotomi Hideyoshi, who went on to lead his powerful army across the land. The series began with the Toyotomi army launching a major attack on Odawara Castle, home to the Houjou clan. The Date army tried to interfere and were brutally defeated by Ishida Mitsunari, a loyal warrior renowned as 'Toyotomi's Left Arm'. Despite their overwhelming strength, the Toyotomi attack was stopped when Tokugawa Ieyasu rebelled against Hideyoshi's methods and killed him in combat. Hideyoshi's loyal strategist Takenaka Hanbee died at Odawara too, leaving Mitsunari behind to curse Ieyasu's name and swear revenge against his former ally. 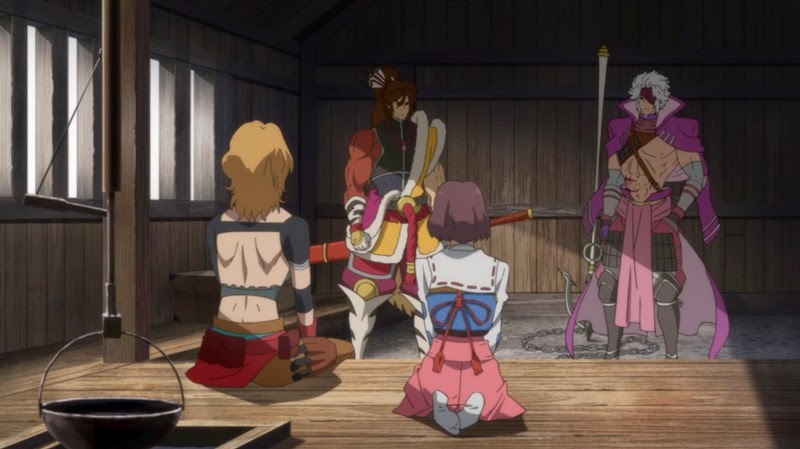 Since that day, Mitsunari and his loyal retainers have been working to expand the former Toyotomi army by building alliances with the Mouri, Chousokabe, Shimazu, Ootomo, Tachibana, Kobayakawa and Kuroda clans. 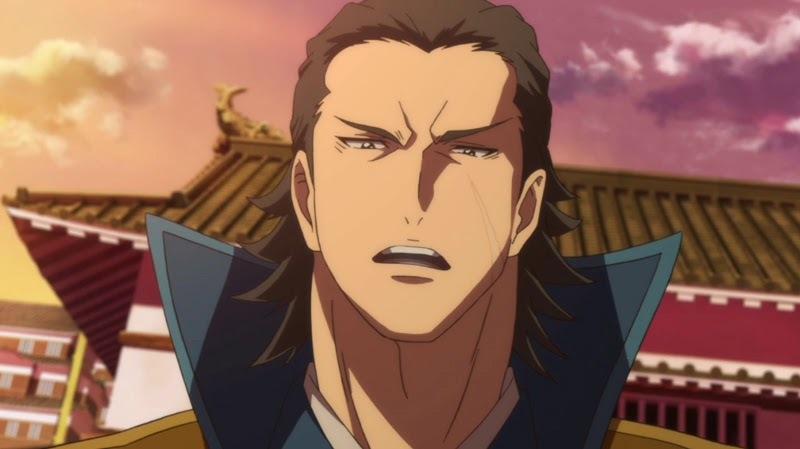 After some soul searching, the newly appointed general of the Takeda clan - Sanada Yukimura - decides that the Takeda forces will join the growing 'Western Army' as well. 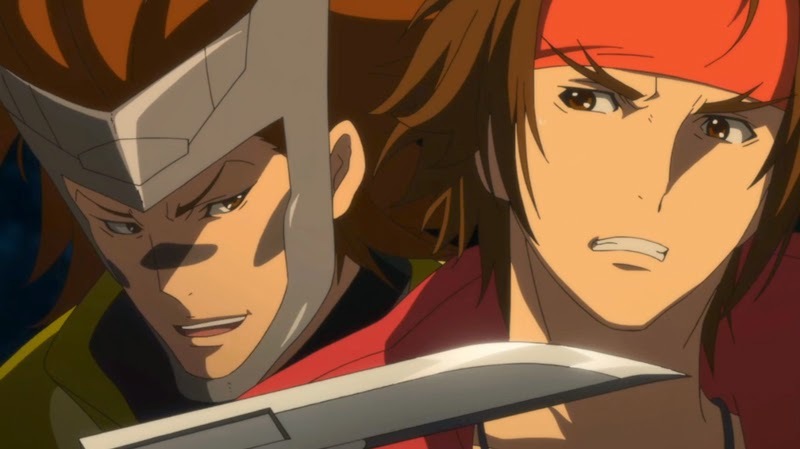 He risks his life protecting its leader from his longtime rival, Date Masamune. 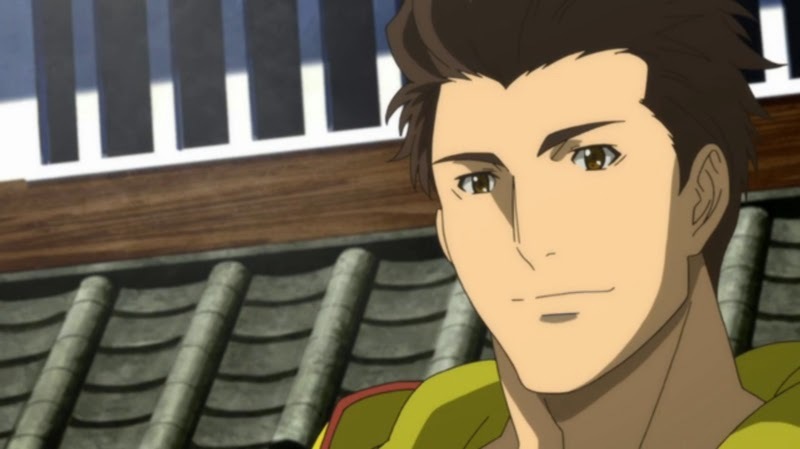 At the same time, Ieyasu is travelling around Japan to unite other commanders and form an 'Eastern Army'. 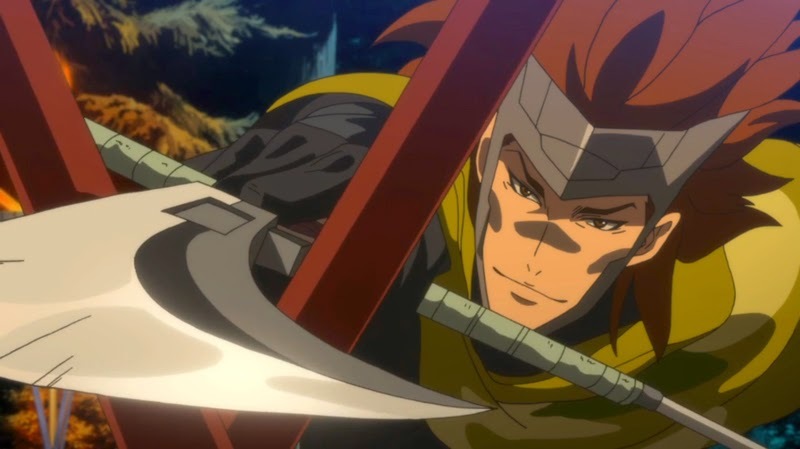 Aside from the shattered Houjou clan and its legendary ninja, Fuuma Kotarou, Ieyasu has been struggling to gain supporters; his respectful approach is no match for the scheming of the Western Army's tacticians. 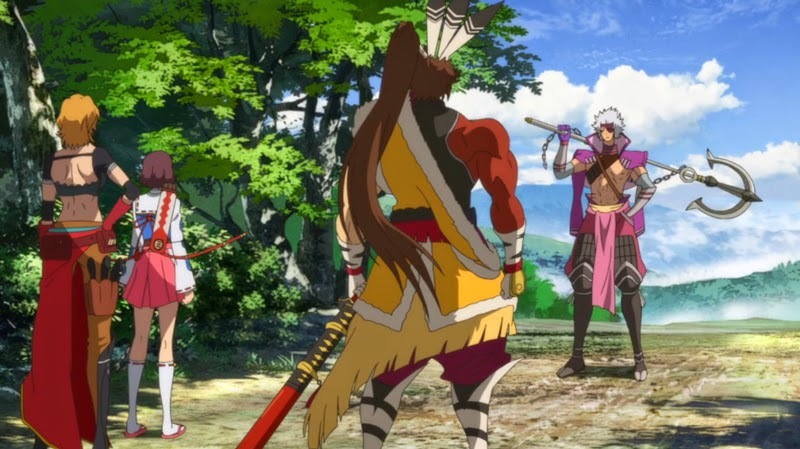 Ieyasu encounters Oda Nobunaga's sister, Oichi, on the battlefield, but her supporters from the former Oda army have been pressuring him to hand her over to them. 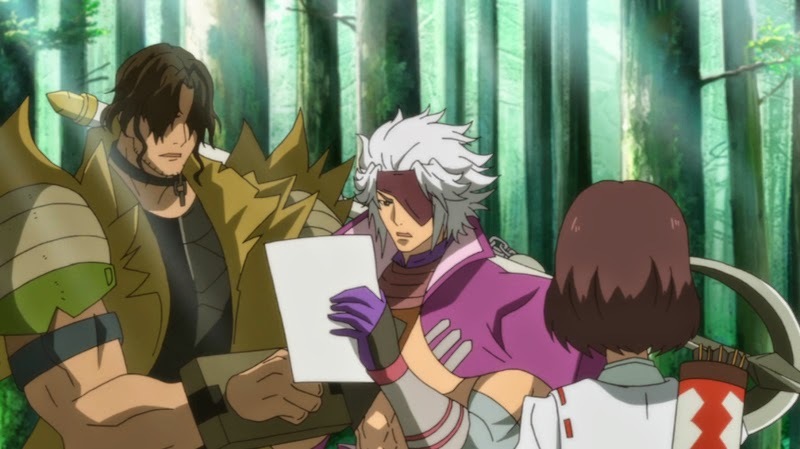 Elsewhere, Maeda Keiji has joined up with the powerful Saika mercenaries to try to locate his missing aunt, Matsu, who was reportedly abducted by Ieyasu. 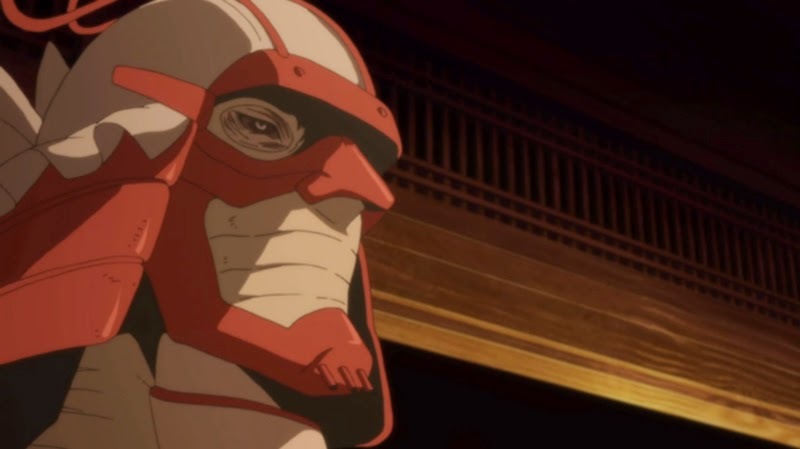 In reality, Matsu is secretly being held captive in Kobayakawa Hideaki's castle under the watchful eye of his mysterious advisor, the monk Tenkai. 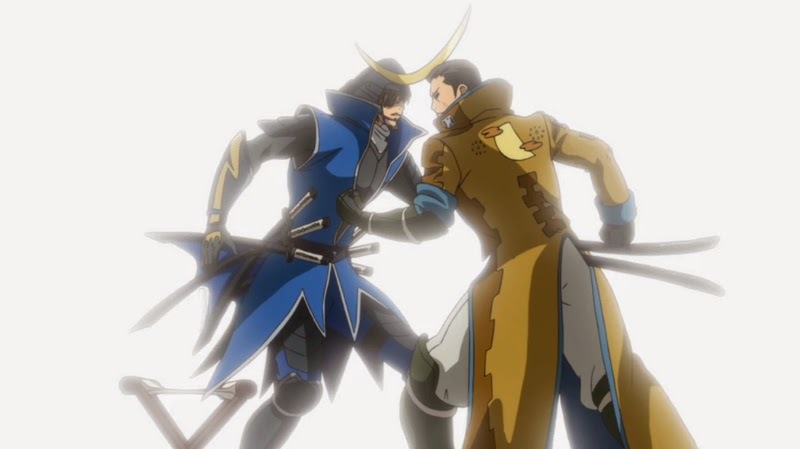 After suffering a string of humiliations since his defeat at Odawara, Masamune decides that the best way to get Mitsunari's attention is to attack the person he hates most. He immediately goes to challenge Ieyasu to a one-on-one fight - and loses. 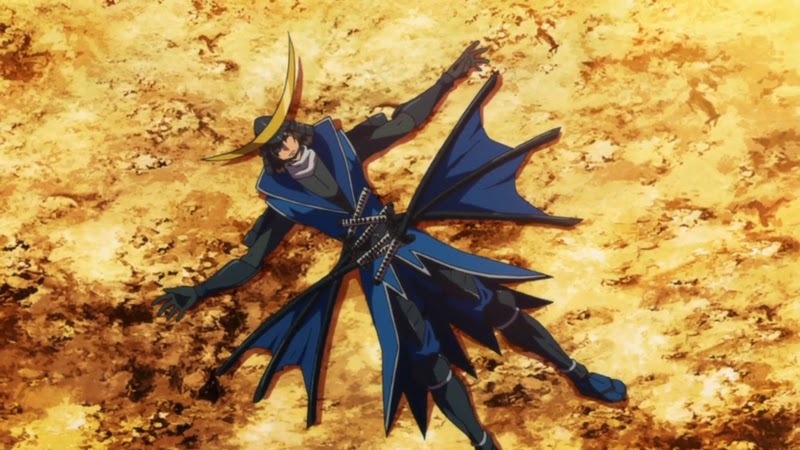 Masamune has lost his duel with Ieyasu. Kojuurou impresses Ieyasu by sternly chastising Masamune for his recent behaviour. Addressing him by his childhood name, Bontenmaru, Kojuurou forces his lord to think back to his very first campaign...and the heavy losses he experienced. At last, Masamune calms down. 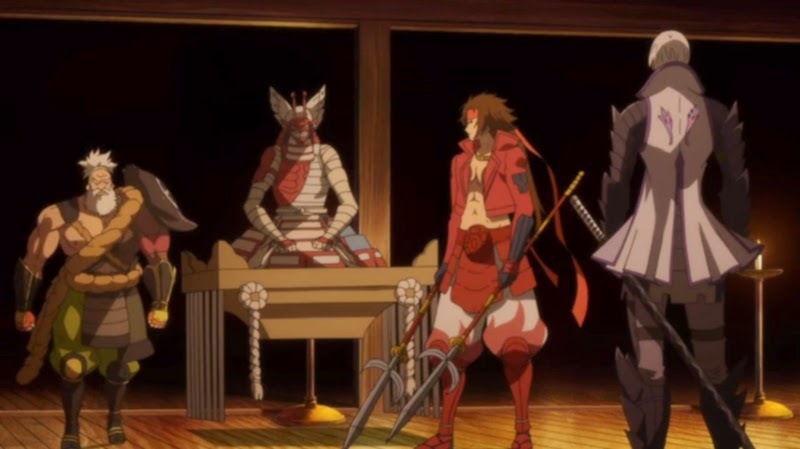 In the land of Kai, Yukimura returns to Shingen's bedside to reflect on what's happened. He remembers an old promise he made to Sasuke. Back in the past, Sasuke once confronted Yukimura and questioned his ability. The two ended up earnestly fighting one another. 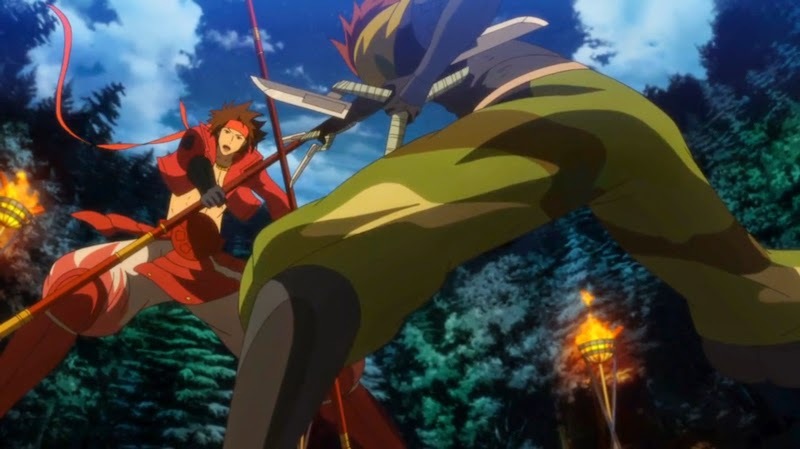 But Yukimura focused and showed his true strength, impressing the ninja and earning his loyalty. Still troubled by her earlier vision, Tsuruhime heads back to meet up with Magoichi - but Motochika and Kanbee appear before her instead. They don't want to fight. 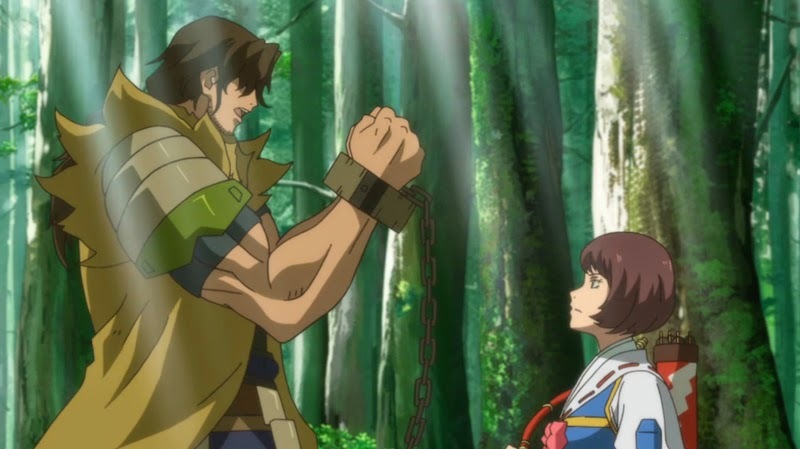 Kanbee is simply seeking Tsuruhime's help in looking for the key to his shackles. Tsuruhime decides to perform a divination. In it, she sees a (rather romanticised) vision of Fuuma Kotarou. 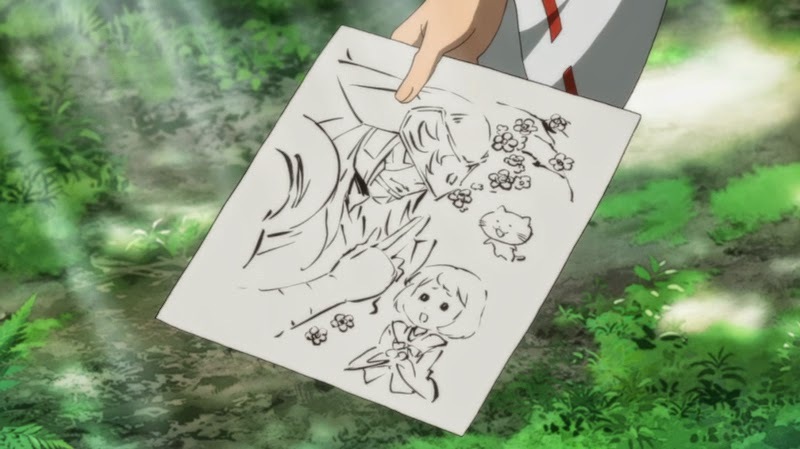 She draws a sketch and Kanbee immediately recognises the legendary ninja. 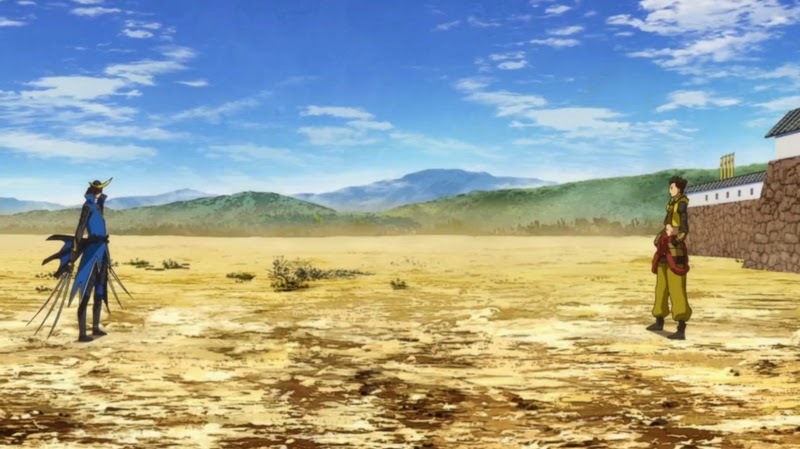 He rushes off eastwards to look for Kotarou, leaving Motochika and Tsuruhime alone. At that moment Kotarou is below Sunpu Castle along with Sakai Tadatsugu. The pair of them are watching over Oichi, whose dark hands have been pinned to the floor. 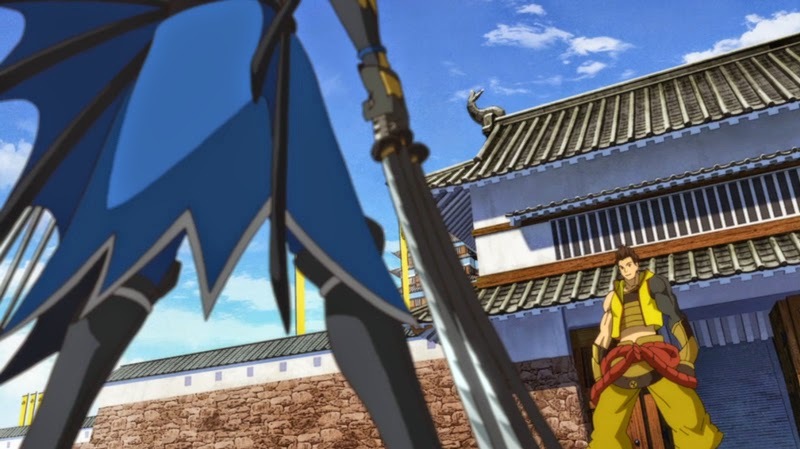 Ieyasu enters the room with a look of concern etched upon his face. Oichi still doesn't seem to recognise Ieyasu, asking him why he's stained with blood - like her brother. Tadatsugu isn't happy about the comparison but Ieyasu stops him before he frightens Oichi further. Still being followed by Motochika, Tsuruhime finally makes it back to Keiji and Magoichi and tells them about the confusing vision she had back when she encountered Ieyasu. Motochika suggests that Magoichi joins him in the Western Army for old times' sake, addressing her by her old name, Sayaka. Keiji and Magoichi ask Motochika what happened to cause him to join up with the Toyotomi like this and he explains that Ieyasu has changed. Full of emotion, Motochika presents the Tokugawa flag he found in his devastated homeland as evidence. Magoichi challenges Motochika, saying that a flag isn't solid proof of anything. He takes offence to her questions until Keiji leaps between them to stop him from attacking Magoichi. Keiji has his own lingering misgivings about Ieyasu too. The focus shifts back to the Western Army. Shimazu Yoshihiro greets Yukimura warmly as he arrives at Osaka Castle. 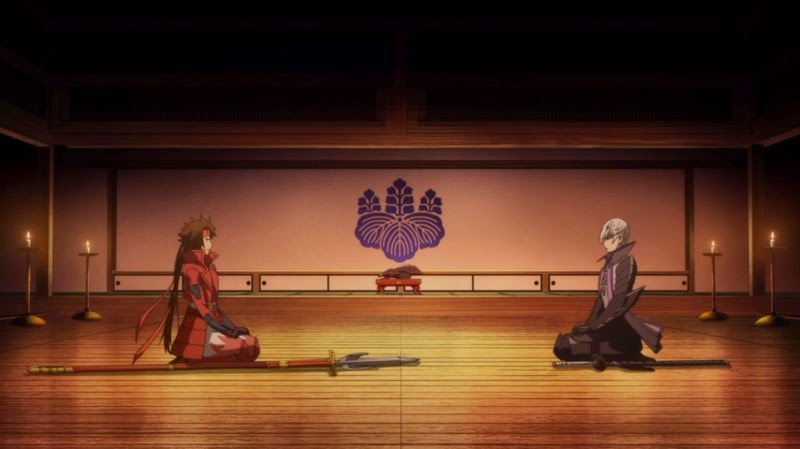 It's finally time for Yukimura to have a proper face-to-face meeting with Mitsunari to discuss their respective intentions. 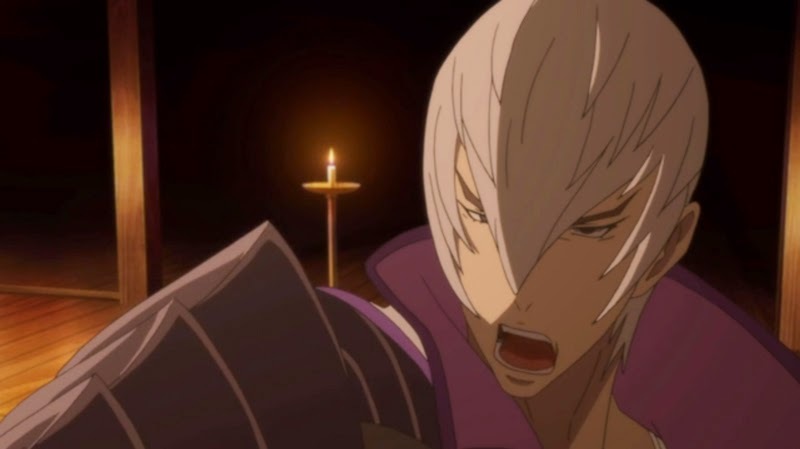 Mitsunari tells Yukimura about his single-minded hatred of Ieyasu. 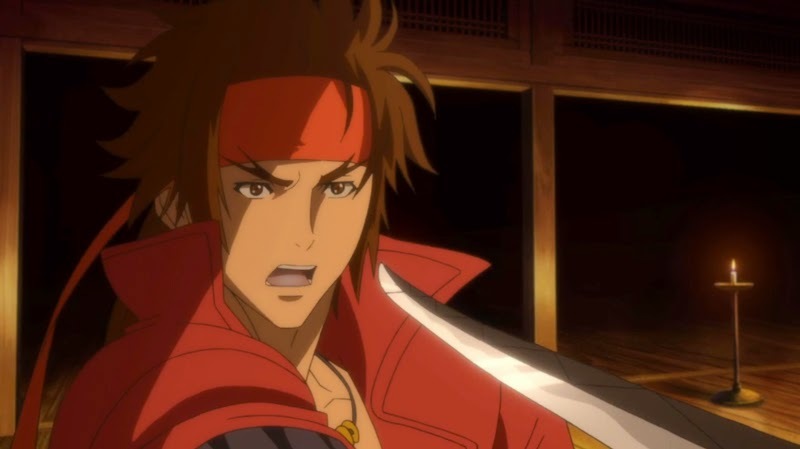 Yukimura is shocked; surely Hideyoshi would never have wanted things to come to this. 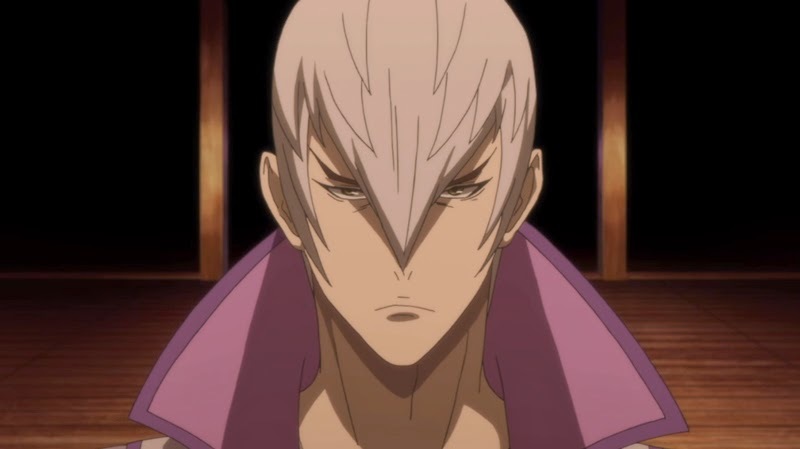 He questions Mitsunari and ends up angering him. The two men fight inside the castle. Yoshitsugu stops them both just as they seem to be evenly matched. 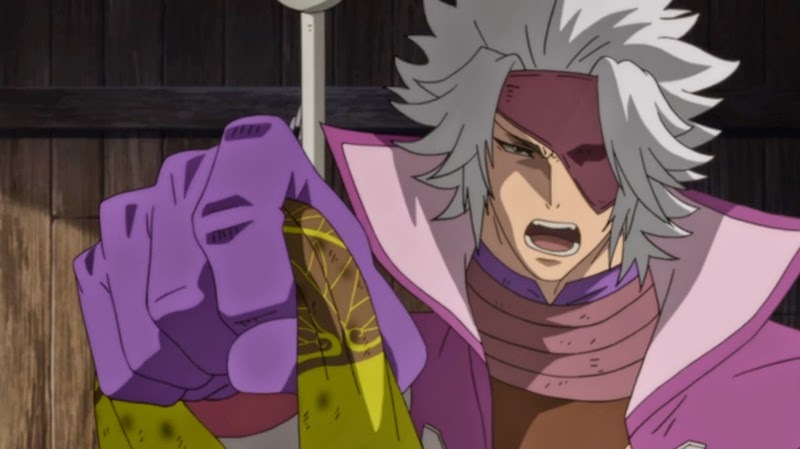 Yukimura remarks that he and Mitsunari are both the same. His battle with Mitsunari seems to have helped him understand the other man's feelings. Masamune, meanwhile, has made up his mind. He challenges Ieyasu to another battle with a clear head. 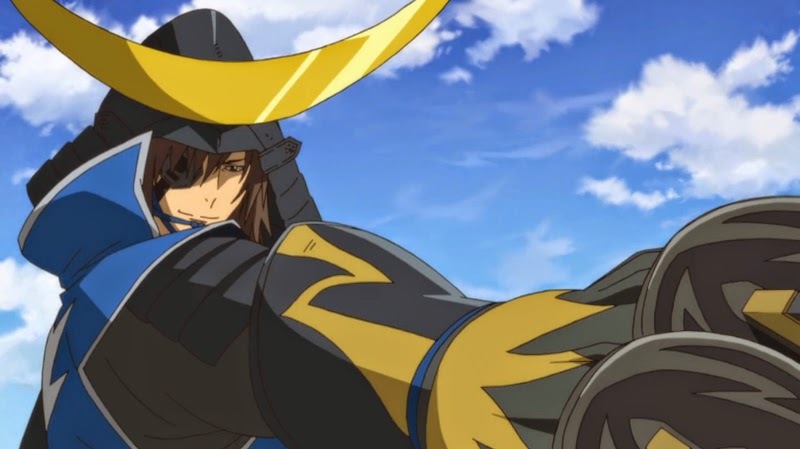 This time, Masamune is victorious. He decides that forming an alliance with Ieyasu might not be a bad idea. These two men, too, have reached a kind of understanding at last. 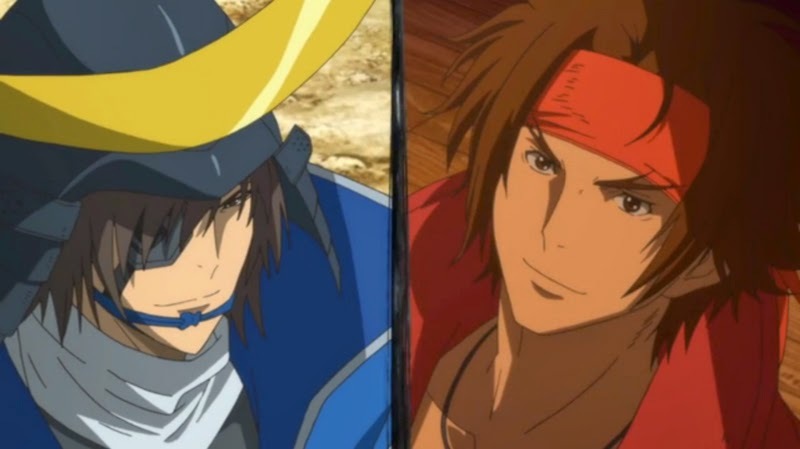 And with that, it's decided: Masamune will fight in Ieyasu's Eastern Army, and Yukimura will join Mitsunari's Western Army! There are now 58 days remaining until the Battle of Sekigahara. It didn't feel as though much happened in this episode so I was shocked when the ending credits began - the fights had made the time fly by! For some reason, I noticed the background music more than usual this week. It's pretty good, even if it doesn't stand out as much as Sawano Hiroyuki's glorious score from the older adaptations. All of the main players are now assembled, so as the series moves into its second half we should start seeing the results of all of these plans and alliances. I'm still really enjoying the show! 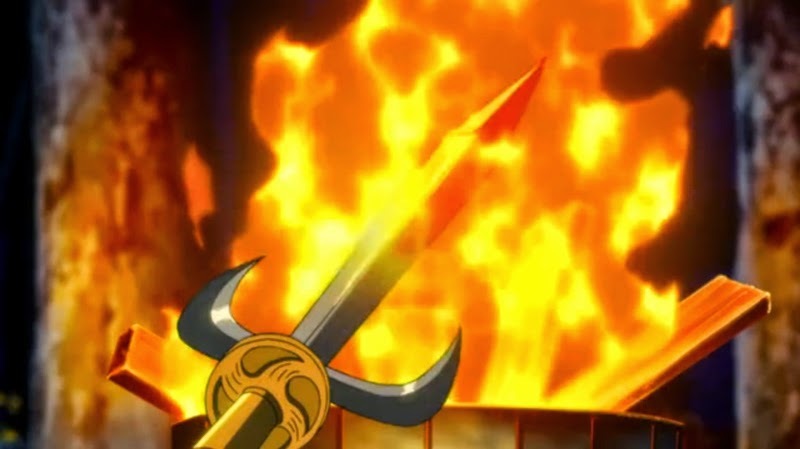 Next week's episode will be titled Ankoku ('Darkness'). I think my favourite battle was Sasuke versus Yukimura because they used so many different moves, but the Date army flashback was great too! I'm confused: all daimyo seemed to side with Ishida. Only Hojo and Date supported Tokugawa, and Kuroda is still by himself, right? That's right, it looked as though Kanbee was going to join up with Motochika but now he's gone to meet with Houjou Ujimasa and his ninja in the heart of the Eastern Army, so who knows what will happen next? Ieyasu's approach of trying to win everyone over with bonds hasn't worked at all so far compared to the scheming that the Western Army are using. God JE sure has been brutal to Masamune, I was kinda shocked by it, and that’s coming from someone who enjoyed his smackdown in ep 1. Good that he has come to his senses now. I had thought that maybe Oichi and Ieyasu were good allies like in one of the stories. Well, her being in a forgetful and aggressive state goes well with the whole reviving Nobu thing. If they manage to get in a moment of Tsuru and her befriending each other though, it would be so sweet. 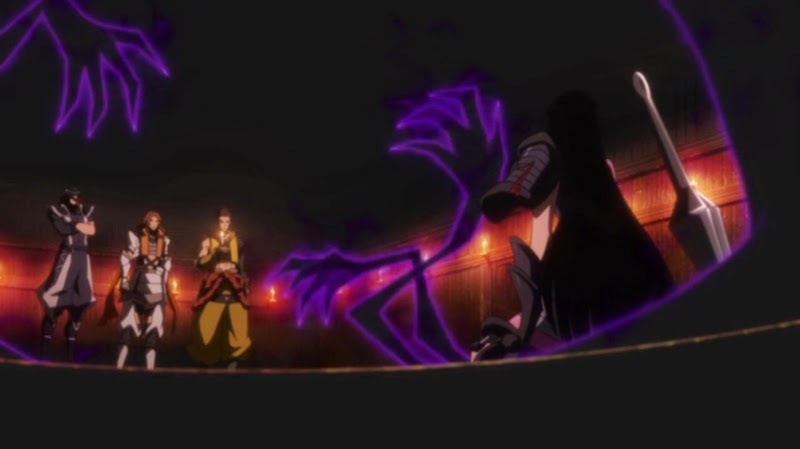 What could the dark thing that they both can see about Ieyasu be! ”You’re like my brother”? Oh my! 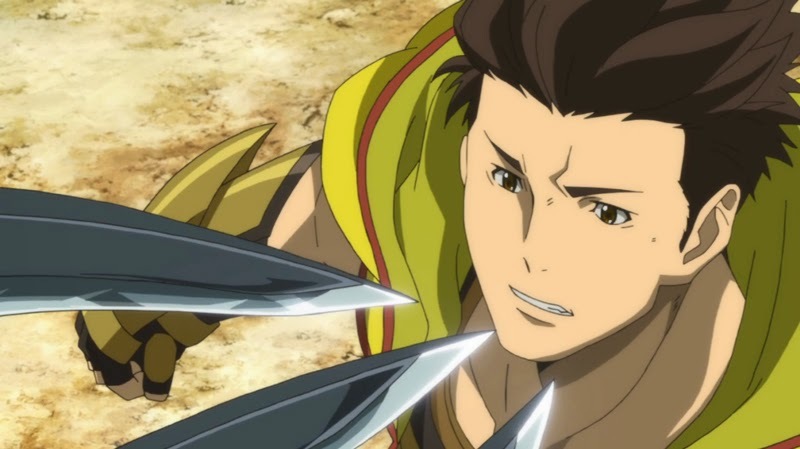 Ieyasu is obviously not as bad as his enemies are trying to make him seem but he is still a bit suspicious in this anime. I have enjoyed the two latest eps a lot perhaps because there is less angsting in unison and more energy - moving towards unknown plot territory. 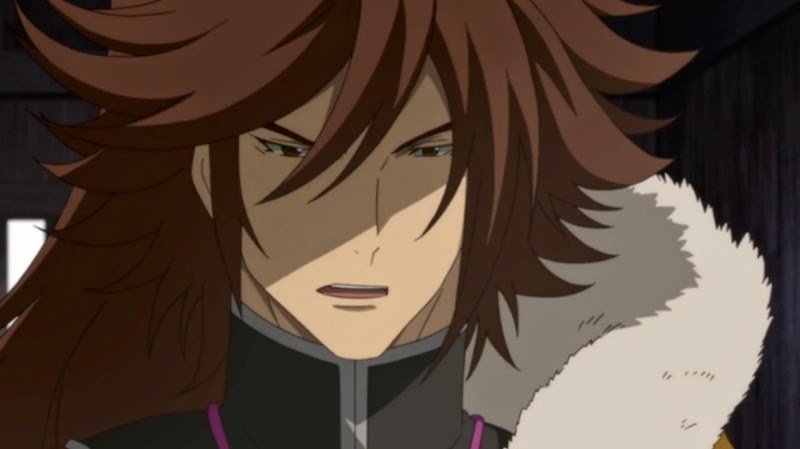 It's good that Yukimura has now channeled his angst into fighting spirit (and before the halfway point!) and Masamune is finally back on track. I can't wait for next week! Another good episode. 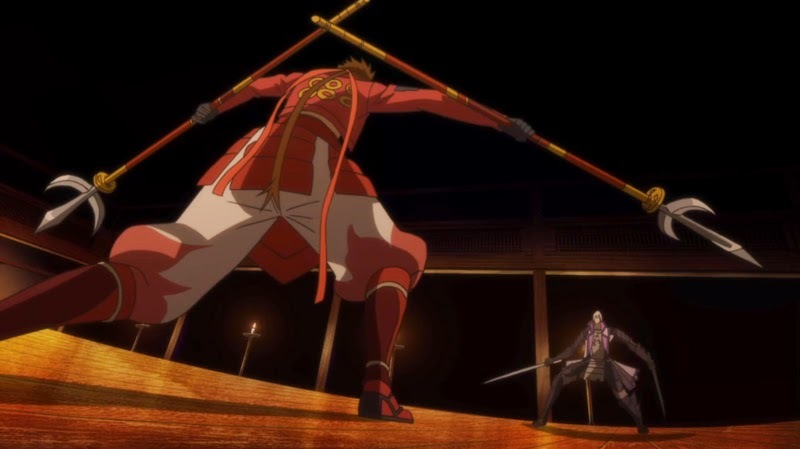 Still i kinda found not so well animated the Mitsunari vs Yukimura little fight and Masamune vs Ieyasu round 2 was twice punch vs front of the claws, they could have done better but still good on general level. 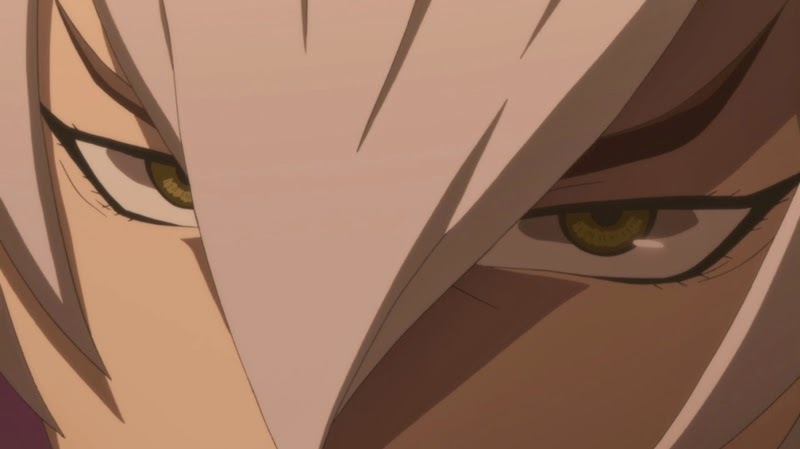 The whole "Ieyasu's Dark Side" thing is getting more creepy episode by episode but in my opinion is just regret because he knows that what he has done (killing Hideyoshi, making Mitsunari suffer) and what he will be forced to do in order to achieve his "Kizuna No Sekai" is something that has a cost he must pay. 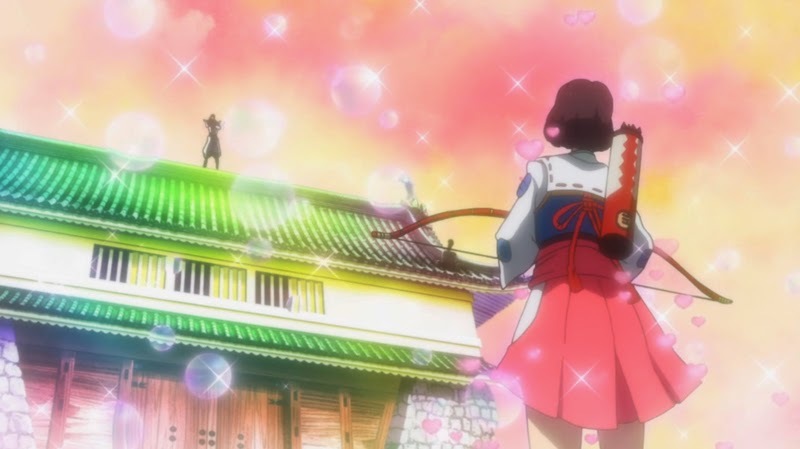 Then seriously, Oichi's Dark Hands blocked by...kunai on the ground? Is it like Peter Pan's shadow or what? Then, Motochika's face while looking at the sketch was priceless, like wtf XD Kanbe's bad luck its starting to flow i see. 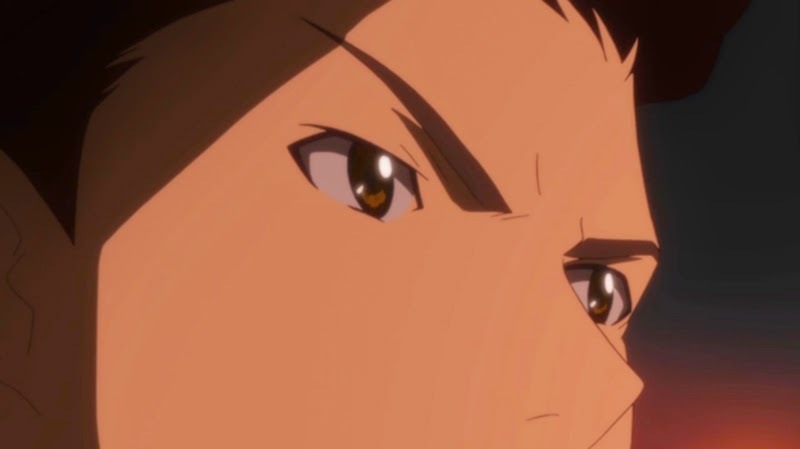 Magoichi stating Motochika's naivety and pointing out he does not have the courage to ask Ieyasu himself the truth, that's where the bitterness of this episode goes to this time around. 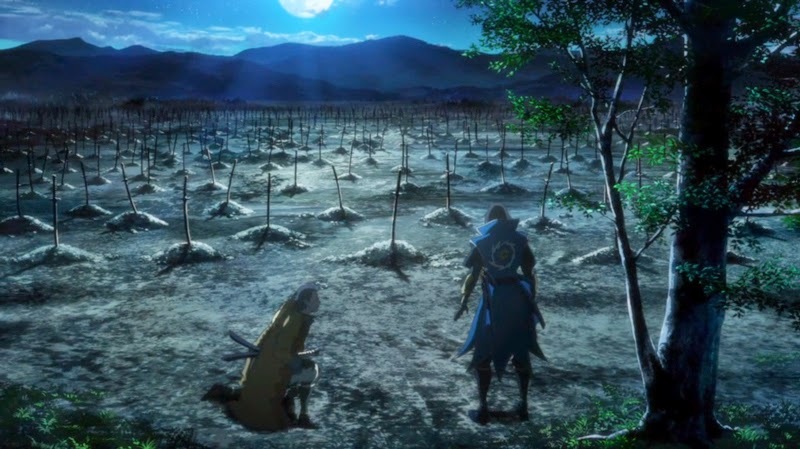 Really liked the flashback of Bontenmaru with Kojuro's "last" lesson and the regret of his fallen soldiers (would have liked to see dead soldiers with his encounter with Mitsunari too like in the game and the manga, this way the flashback with his dead soldiers and his will to not let that happen again would have added even more drama). But yay, the old Masamune is back again full of himself like never and Yukimura's resolve is strong indeed (why Yukimura and Mitsunari was panting like they went on a full rampage for an hour ?). Haha, if only it was that easy to shut Oichi's dark hands down in the games! 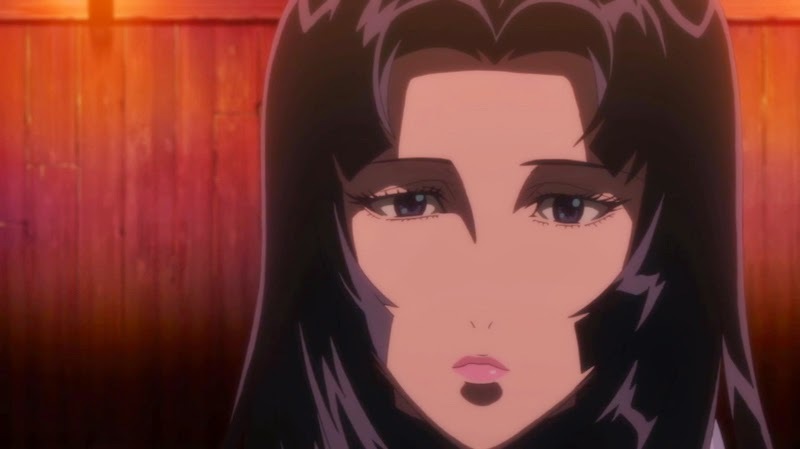 Magoichi was so cool in this episode, I love how calmly she dispels everyone's silly assumptions all of the time. The dark visions people are having of Ieyasu being his own self-destructive regret is an interesting way of looking at it. He's always so polite and open on the surface, but there are a few moments which show he's got a lot of worries under the surface. I hope we'll get some more direct development within the Tokugawa army soon and maybe some flashbacks with Tadatsugu - perhaps that will happen when Motochika and Keiji eventually meet up with them. Yes it could be vision of his past deeds, but also the future. What if Tadatsugu ironically betrays Ieyasu because he doesn't approve of Ieyasu's so far failing methods and they fight. IDK just have a feeling something bad will happen like that. Magoichi was the source of common sense in this. If Motochika trusted his friend so much, why automatically assume that he had attacked his base, without critical thought?